Over 100 employees of American Water Resources came together for a unique team building experience in St. Louis, Missouri. AWR hosted two Camaraderie Quest Team Scavenger Hunts on consecutive days. The Camaraderie Quest is a high tech scavenger hunt in which the participants learn the importance of clear communications, alert observations, and having fun to build teamwork and camaraderie. The venue was The Old Courthouse and the Hyatt regency Hotel in St. Louis Missouri,. 10 teams one day and 6 the next had to find items, answer questions, take pictures and even make some videos in the different locations. It was a fun time of getting to know each other better while accomplishing a fun but difficult task. The Camaraderie Quest Team Building Event can be a great opportunity to get out of the office and do a fun activity together. Especially when workers are in physical proximity, our interactions can become predictable and repetitious. We get used to seeing each other in certain surrounding, working on similar tasks, doing the same things and in the same environment. We do a good job and it becomes routine, which can be dangerous. That is one reason the group from AWR came together- first as a reward for a great year, but also to spurn on excellent continuation of the progress made. When we get out of those surroundings and get to know each other little better we get new insight into each others personalities and a different revelation of what other individuals are like. We also get to expose our selves to others and prosper form being a little more vulnerable. These can produce positive growth in each individual and so foster growth within the team and the entire organization. The theme for the days meetings was “Gateway to the Future”. Thanks to American Water Resources for a great Camaraderie Quest Team Building Event. What a great way to have fun, see each other in a little different light, and learn some great team building skills. 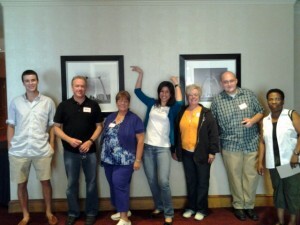 For details about a Team Building Event in St Louis, click here.